This project intends to reveal my physical organ built first in 2001 with a Xilinx XC4000 PLD and analog environment. See the PLD organ page. All hardware was totally replaced by VHDL and moved to a current Spartan 3 FPGA. A virtual keyboard controller is established by adding a wave player module to obtain automatic song performance. The RAM holds around 3900 music events which are processed and mapped to the virtual keyboard, which provides 7 x 5 = 35 notes and thus covers all the white keys of 5 octaves altogether. The tuning is C-Major. 2 Organ registers are available. Both registers can be enhanced with an analog boost option to emulate the individual analog configuration of the sub modules. For more information about this strategy see the Virtual PLD organ page. 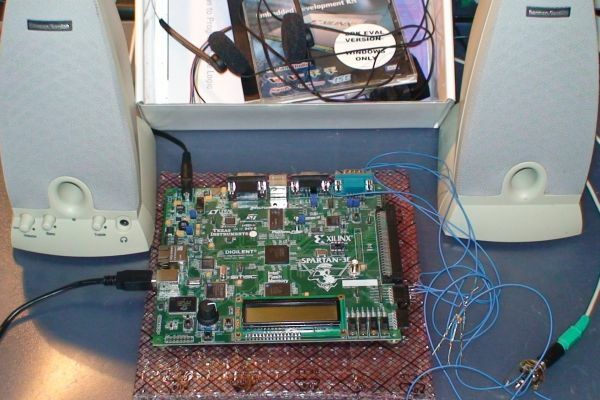 Digilent Spartan 3E Starter Kit with Xilinx FPGA. One main Organ Module drives 5 sub circuits. Here 5 channel groups are used and placed on a discrete stereo base. Find more information at the S3E Audio Page: PLD ORGAN V2001. Rotary Knob / Push button : Restart the Song. Since the Digilent PCB does not have an audio out, a dual PDM (pulse density modulation) module is used to generate a 1-Bit-Data Stream similar to audio-PCM. The frequency is 15 MHz like with the original PLD design. 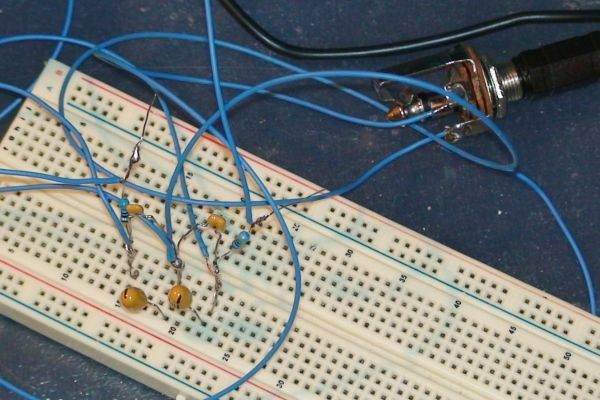 To be able to hear the sound, a RC-Filter has to be added to the two output PINs of the Digilent Port Pins. One can find them at the upper MOD-Connector. Use Pin "A4" for LEFT and Pin "B4" for RIGHT. The RC Filter should be made of R=470 Ohm and C= 10nF(ceramic) / 1uF(Tantal) in parallel. Please note, that in this demo, only one RAM is available. See the included readme.txt file for details.